If you work for a distribution network operator (DNO), you probably spend a lot of time planning for the future. That’s partly because modern distribution networks are no longer designed from the top down. Traditional electric distribution networks weren’t crafted with today’s technologies in mind. They couldn’t have been, of course, thanks to humanity’s inability to see into the future or travel through time (other than via our normal, day-by-day method). 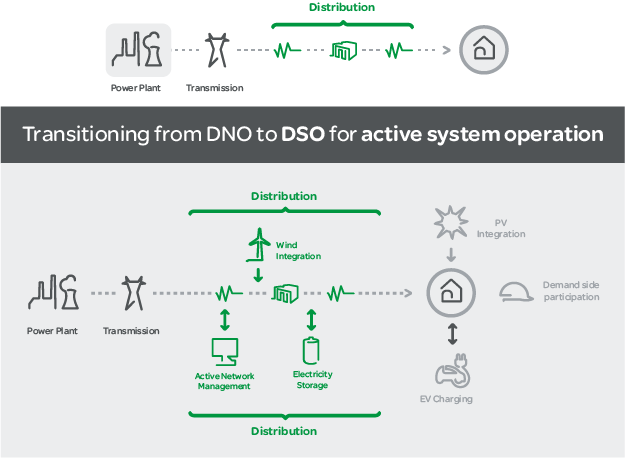 The traditional DNO distribution model focused on the one-way delivery of electricity, with clear and reliable definitions of upstream and downstream. With the introduction of distributed generation (DG), renewable sources, energy storage, and microgrids, the classic DNO model is changing. These technologies can have impressive consequences for the design, operation, maintenance, and improvement of distribution networks everywhere. Today’s technologies and distribution practices are capable of delivering greater energy efficiency, sustainability, and cost savings than possible under the traditional model. For DNOs, this changing utility landscape is steadily stimulating a transition from the one-way street of electricity delivery to a more complex, systemic model that accounts for and manages multiple points of variable supply and consumption. Employing these modern technologies and practices are what separate the Distribution Network Operator from the Distribution System Operator. And it’s not simply the act or state of connection that bestows the DSO title on an operator. It’s more sophisticated than that. It requires not only interconnection, but also that each element is integrated within the system perspective. That system perspective considers not only the complex interrelationships among each of the system’s sources and sinks, but also manages the coordination between network operators and the prosumers they serve. This is the notion of active system management. In order for DSOs to satisfy customers—especially during times of peak demand—they must account for an enormous variety of production and load scenarios, as contingencies rise in step with the number of Distributed Energy Resource (DER) mechanisms added to the network. Accommodating the addition of new part-time energy sources further swells network management complexity. DG, Demand Response (DR), and Energy Storage (ES) mechanisms introduce new variables to any system. These new variables require a more flexible network, not only with respect to its operation, but also investments in new network infrastructure—as well as ways to manage and develop that infrastructure at the lowest cost. The DSO also faces challenges that the DNO does not. DSOs must deal with flexible demand, and operate networks that can accommodate dispatchable resources like DR. They control networks capable of intelligently aggregating many different geographically dispersed inputs and the complications that come with that. For example, DG sources can’t always control their own production levels. Increased feed-in can also exceed local load, causing grid congestion, or have voltage variation and other power quality problems. What’s more, DG source locations are sometimes less than ideal, i.e., they’re not close to the highest loads, where they might most efficiently alleviate peak demand. DNOs don’t become DSOs overnight, but over time. A long time. And the rate at which that transformation occurs varies. It varies by continent, country, and region. And also by the legislation and regulation of the governing bodies to whom they are subject. While rates of new technology adoption vary from place to place, many network operators feel pressure to accommodate new players and stakeholders with new roles, such as prosumers and microgrids. The “DNO” term, by the way, originated as a European acronym for regulated network operators conducting business under the European unbundling scheme. The term “DSO,” on the other hand, is itself slowly spreading from Europe to the United States, though that’s not to imply that diffusion of related technologies always follows a similar direction. Get in touch if you want to talk or learn more about the DNO to DSO transition. One more thing: Now’s a great time to start thinking about attending CIRED 2015. I’ll be there along with many other experts from Schneider Electric. CIRED is a reliably excellent forum for sharing ideas, discussing solutions to problems, and learning more about the future of electricity distribution. Hello, I’ve been trying to get a clear understanding of the difference between a DSO and a DNO. From your post above, it sounds like this is a gradual process, regarding the way that distributed generation, active network management and storage are integrated. However, I was wondering whether there are any specific regulatory definitions that would apply to each? i.e. are there aspects of the DSO role which a DNO would not be allowed to do? I am working in a UK context, and am aware that in the UK, electricity storage is categorised as ‘generation’, and a DNO is discouraged from owning it, which limits the emergence of DSO. Any suggestions of accessible but detailed information on this would be welcome. Thanks! You are right. The transformation from DNO to DSO will be a long journey. Since the acronym DNO was incepted in the UK, the local community sticks to this well known term. The fact that all forms of storage are categorized as generation is another a major issue that needs fresh thinking. For further readings on this matter, I would recommend to review the proceedings from UK contributors of last CIRED conference (http://www.cired2015.org/) as well as European Utility Week papers & videos (http://www.engerati.com/event-presentations) and the UK portal (http://www.smarternetworks.org/).